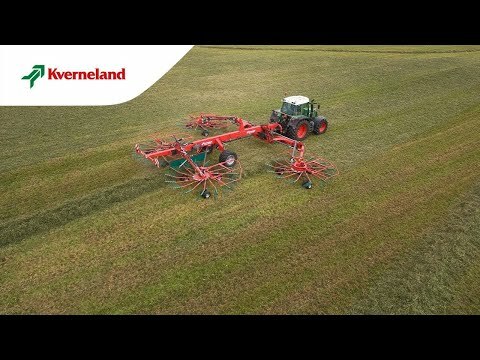 Kverneland 97150 C, with 15.00m working width, is a machine designed for high output. It is a heavy duty rake with very substantial capacity and adjustable working and swath width, that can be easily changed during work. Four rotors with up to 15 tine arms ensure a perfect raking performance. 15.00m working width increases the entire processing of grass, and leaves a huge, even swath for the following machines. Hydraulic adjustment of working width width between 9.80 and 15.00m. Hydraulic adjustment of rotor height. Active steering wheel axles for excellent manoeuvrability. Clever folding mechanism, allowing the rake to go below 4.00m without removing tine arms.